We’ve all heard of floating architecture, but what about a floating forest? Dutch design collective Mothership plans to install the ‘Dobberend Bos’ (Dutch for Bobbing Forest) in Rotterdam’s Rijnhaven harbor. 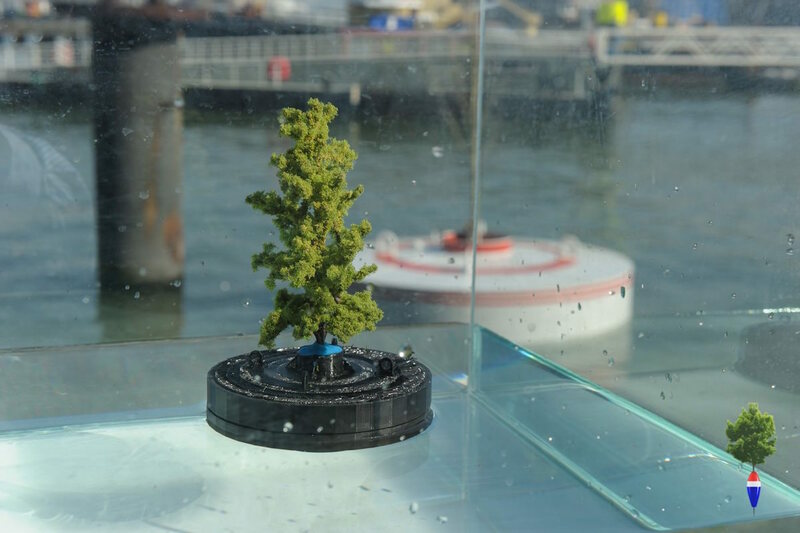 The small floating forest of 20 trees will be “planted” next spring inside a set of colorful, recycled buoys. The Dobberend Bos was inspired by the work of Colombian artist Jorge Bakker, who created ‘In Search of Habitus,’ an aquarium filled with tiny buoys and model trees. The artist is known for his sculptures and installations designed to make the overlooked elements of our surroundings, such as water and wind, visible. Mothership seized on this idea and, after years of experimenting with prototypes, will install a small floating forest in Rotterdam’s historic Rijnhaven, which will host model projects in floating architecture until 2018. The trees will be sourced from the city’s tree bank and placed inside 20 discarded buoys repainted and adapted to the trees’ needs. The trees will not be exposed to the harbor’s brackish waters. “These miniature trees floating on the water raise questions about the relationship between the city dweller and nature,” according to a statement on the Dobberend Bos website. “What does a city dweller have with nature and how humans and nature relate to the world around them?” The project is scheduled for implementation on March 16, 2016. The Dobberend Bos was inspired by the work of Colombian artist Jorge Bakker, who created ‘In Search of Habitus,’ an aquarium filled with tiny buoys and model trees. Mothership will install a small floating forest in Rotterdam’s historic Rijnhaven. The trees will be sourced from the city’s tree bank and placed inside 20 discarded buoys repainted and adapted to the trees’ needs. The trees will not be exposed to the harbor’s brackish waters. “These miniature trees floating on the water raise questions about the relationship between the city dweller and nature,” according to a statement on the Dobberend Bos website. The project is scheduled for implementation on March 16, 2016.